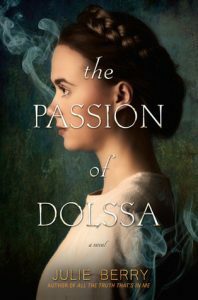 “The Passion of Dolssa” (Viking 2016) by Julie Berry is certainly an oddity in the world of young adult literature—and what a terrific oddity. The subject matter will not be found in many U.S. high school curriculums. Set in 13th century Provence or Provensa, as it was called at the time, the story centers around 18 year old Dolssa, a Catholic mystic, born in the waning years of the crusades to a prosperous wine merchant. This was also the dawn of the Inquisitions that are best know for the later Spanish Inquisition of the 15th century. Just as important as Dolssa (or more so) is 17 year old Botille the aspiring matchmaker, along with her two sisters, beautiful older Plazensa who dabbles in prostitution, and Sazia, younger, who tells fortunes. When their parents died some years back, they’d become petty thieves, but since, had moved to the seaside village of Baja and opened a successful tavern. The early chapters are Dolssa’s testimony as recorded by Father Lucien of the Cloistered Fathers in Tolosa (Toulouse). She speaks of her beloved Jhesus who she claims visits her and directs her actions—which many in Tolosa see as miracles of healing. However, Father Lucien condemns Dolssa as a heretic. When she will not renounce her “beloved” she is sentenced to burn at the stake. Where as Dolssa’s sympathetic mother is not as fortunate as her daughter, Dolssa escapes her execution. She is wandering the countryside close to death, when Botille, while traveling with her sister Sazia and neighbor men on a village errand, saves her. Sazia predicts that Dolssa will bring Botille only pain. But spunky clever Botille cannot turn the suffering young woman away. They bring her to Baja and begin nursing her back to health. Father Lucien and the Knight of Tolosa are searching for Dolssa under the orders of the archbishop who must rid the Catholic world of the devil—that is—“heretics” such as Dolssa. We learn that the Crusade, that recently swept through the area of what is now southern France, was a bloody purge and the Inquisition is the next step of the church’s attempted control of its faithful. The reader sees how an oppressive force works one neighbor against another. Betray a friend to save one’s own family. The cast of nuanced characters is listed in the back, as is a copious author note that further describes this little known moment of history, which is reminiscent of the Salem witch hunts, as well as a precursor to how the Nazi regime gained control of the German population. This is every bit an adult book as well as a young adult read. It’s exquisite.